One of the Tornado Marine Fleet boats Cyclone offers to explore underwater treasures of Red Sea. Cyclone Liveaboard can welcome 20 divers and their fellow travelers on board. Boat has 10 twin cabins that can be shared. All rooms equipped with private facilities and air conditioning. Lounge zone of Cyclone perfectly suits to relax in between and after dives. It has air conditioning, entertainment facilities. Boats guest can enjoy the view from the sun deck. You will find there several sun loungers and a jacuzzi. Dive deck of Cyclone Liveaboard has plenty of space, it is comfortable for preparation for the dive. Dive deck is equipped with necessary facilities to maintain equipment like rinsing tanks. For divers with enriched air certification, there is an availability of Nitrox using. Safety is always in the first place for crew team of Cyclone. Boat supplied with fully stocked fist aid kit, fire fighting and alarm system, life jackets and emergency raft. 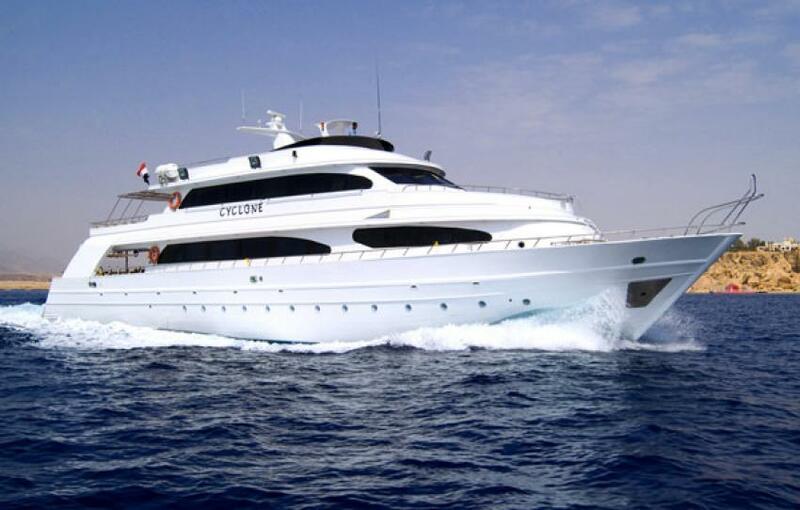 Cyclone’ itineraries include diving on the well-known wrecks of Red Sea. Divers will have an opportunity to discover Abu Nuhas ship cemetery. It consists of five ships, that sunken in different time and lies on a different depth. Some can be explored from the inside like Giannis D, some are available only for advanced divers. Another famous wreck is Rosalie Moller. This sip lies in the bottom covered with thousands of corals. Now it became a home for fish. One of the most recognized wrecks of Red Sea is Thistlegorm. It can be considered as must see dive site of Egypt. It was sunken during the World War II and tractors, cars, motorcycles are still stood on its board. Visibility and water temperature is always good for diving in Egypt. In summer water becomes clearer but the main thing is that the large predators appear here at this time. It is possible to see here rare whale sharks only in summer. Winter season is famous for a perfect visibility and some rare species such as thresher sharks.